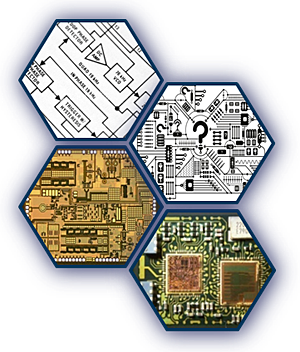 Want to learn more about RF Integration’s history, capabilities and what we can do for you? Incorporated in 1999, RF Integration Inc. is a privately held RF product company. The company has established a considerable RF IP library, put numerous private label products into production, and developed many RFIC products for Cellular, 802.11, GPS, Broadband Wireless Access, Ultra-wideband and Defense markets. From building blocks such as Low Noise Amplifiers or VCOs through complete System in Package (SiP) solutions, RF Integration designs with a Total Systems Perspective. Using proprietary tools such as our System Accelerator tool (SAX) and industry standard tools from Agilent and Cadence, RF Integration supports a full turn-key design flow. Ease of use and overall system performance are designed-in and verified throughout the design cycle. Our strategic relationships with best-in-class foundry, packaging, test & measurement and EDA partners combined with extensive design expertise in SiGe, CMOS, GaAs, SOI and SiP technologies, position RF Integration to deliver optimum cost/performance solutions for your wireless and wideband systems.